[SOLVED] Is &quot;with all due respect&quot; now mainly used as a sarcastic expression? [SOLVED] Is "with all due respect" now mainly used as a sarcastic expression? With all due respect is an idiomatic expression which has been used with he following meaning since the 19th century:. In 2008, the Oxford dictionary compiled a list of the most irritating phrases in the English language, the phrase with all due respect came in as the fifth most irritating phrase in the English language. Perhaps because of its changing function from a phrase meant to mitigate hard feelings to a phrase that allows a subtle disrespect, cloaked in courtesy. Amanda Marcotte – With All Due Respect, You Are A Moron. –Blog headline. When do you plan on submitting your resignation? I ask this with all due respect. –Blog reader responding to request for questions for Senator Richard Durbin. The 2006 movie Talladega Nights: The Ballad of Ricky Bobby, may have influenced the popularity of “with all due respect” used to introduce a blatantly disrespectful and offensive comment. At least twice in the movie, Ricky Bobby says something extremely vulgar to his team owner. He has the mistaken notion that prefacing a remark with the expression “with all due respect” gives a speaker license to insult and offend. Has the meaning of this old expression mainly changed to a sarcastic idiom? What alternative analogous idiomatic expression could now be used instead to avoid possible misunderstandings? "With all due respect" is ambiguous. The phrase shouldn't be used in polite conversation. I'd dislike it if I was sitting at an event and have somebody said that to me. I'd expect it if I was throwing popcorn at the back of their head! I think the phrase "with all due respect" has always been problematic when used as a preface for criticism. OED describes it as a variant of "with all respect" or "with great respect." The latter phrases imply that the speaker respects the entity being addressed, regardless of the situational dissent. 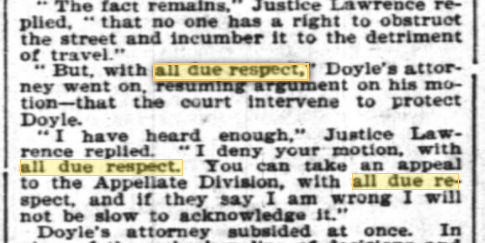 "With all due respect" can really mean anything -- it could imply that the speaker believes the entity is owed no respect whatsoever, or that they are owed great respect, or anything in between. An idiomatic phrase with meaning that depends totally on context is naturally irritating. I would argue that this is not new. Consider this piece in The New York Times, where a judge interrupts an attorney by sarcastically parroting the phrase twice, from 1896. On the other hand, it certainly seems likely, based on the Grammarist article and the other sources the OP provided, that the phrase is used more often in a sarcastic way today than it was in the past. I think it's notable though that the most extreme cases of sarcasm are by comedians and bloggers. The phrase is still active with sincere intent as well. Perusing a Google News search on the phrase reveals numerous instances where the speaker or writer is not being sarcastic. I found these three articles published within the last 24 hours. With all due respect to the Lions, who play a nice brand of football and aren't a bad team at all, it will be ridiculous, bordering on wrong, should they end up being crowned Super Rugby champions in 2017. There's a new show that premiered three weeks ago on Comedy Central at 11:30 p.m. every Thursday called The President Show and, with all due respect to the SNL troupe, this show is even funnier and more relentless than anything we've seen elsewhere. “We saw a guy at Vanderbilt that was a productive guy, but, with all due respect to Vanderbilt, this is a whole different ballgame," Texans coach Bill O'Brien said. Is the phrase irritating and better off omitted? I would say so, and apparently, a lot of people agree. Is it often used in a sarcastic or insincere way? That seems undeniable. The phrase has been pretty meaningless and irritating for quite some time. The phrase is still used often without sarcasm. I agree with your second point, though the sources I cite appear to suggest the opposite. As for point one, I think the idiom is still among the "irritating" ones. @Josh I'm not arguing that it isn't irritating, but rather that it might have been irritating even before recent use. I think the sarcastic uses are a response to how the phrase is hollow and overused. When a comedian says "with all due respect, you're a moron," they're taking advantage of the phrase's flexibility by essentially saying "I don't think you're due any respect at all." They're also mocking the way the term is overused in politics, which was Colbert's schtick for a long time. So the sarcastic use is more an additional meaning than a replacement for how it was used historically. I have been using 'with due respect' here in many situations to preface an expression of disagreement with somebody's opinion, as in "with due respect to username1234, that is not at all what OP intended" or "@username5678 with due respect, your comment might easily be misinterpreted." I think it is an expression of routine politeness as used here to preface a 'friendly argument'. However it can also preface a very hostile (yet icily polite) statement. Sarcasm does not seem apparent. Do many members at EL & U use "with due respect" or "with all due respect" to preface their statements? Very true! According to the earlier definition the statement was always used with respect before a polite disagreement. What I would like to know is (1) are many people using 'with due respect' on this website and (2) if a highly hostile (yet not vulgar) statement follows, as in "@user765432 with due respect to your intelligence, your attitude is highly prejudiced and offensive; you have no absolute right to expect an answer, because we are not simply waiting here to look up grammar rules for your benefit!" would disrespect actually be intended by the preface rather than 'due' respect? @EnglishStudent exactly. Like I posted in my answer, earlier uses were mostly "With all respect" or "With great respect." When one qualifies it by saying, essentially, "With whatever level of respect is due," they allow for it to mean "I think you're due no respect at all." The sarcastic examples take advantage of that angle to say things like, "With all due respect, you're a moron," or something similar. I also got the impression that the modern sense of its usage had acquired an element of self-respecting egalitarian defiance as in "I shall give anyone their due respect and no more than their due!" [SOLVED] Was "the mother of all" a common expression before Saddam Hussein used it? [SOLVED] Difference between "With all due respect" and "Without disrespect"
[SOLVED] Why "No smoking" works but "Yes smoking" doesn't? [SOLVED] Can "To Date" be used with a from date? [SOLVED] Usage and origin of "clock position" expressions. [SOLVED] "In respect of" / "With respect to"
[SOLVED] "To hove to a standard" -- correct usage?